You all deserve a huge amount of credit. You have made Mindy and I feel so comfortable and so blessed. We are, indeed, so appreciative to all of you. You are all so very talented in what you do! Thank you! I just wanted to thank you all at The Town Carpenter for making my kitchen look so amazing with the cabinets and Island you made for us. I was slightly nervous at first because the pricing was half of what we were quoted by a high end designer in Atlanta. No reason to be nervous, You were so easy to work with, you listen to exactly what color I was trying to make the cabinets and I have to say you have far exceeded our expectations! I can’t begin to tell you how happy my husband and I are and how many compliments we get on our cabinets and the custom color you made them! Over the last 5-7 years we have commissioned the folks at Town Carpenter with several projects including cabinetry/desk for a home office, a built-in entertainment unit in the den, storage/workspace in the garage, replacing 1960’s era shelving with a wardrobe cabinet in the bedroom and creating a California king platform bed. Our home is a small ranch and required a good bit of creative solutions to develop as much storage as possible in the limited space available. Caroline was amazing with the design work incorporating our ideas into beautiful and practical final solutions. The level of detail, high quality materials and exemplary workmanship found in each piece continues to astound from the symmetry of the doors/units, drawers that pull out all the way without falling off their tracks, quiet closing cabinet doors, hidden metal shelf holders all the way to the flawless finish whether it was stained or painted. In all our projects, we were never inconvenienced for long periods of time with incomplete pieces. Everything was installed in a day or two (depending on the size of the project), clean and ready for move in. With as much use as each piece has gotten, they have endured over the years and to this day still look amazing. Our friends and family are always impressed every time they come to visit. We would not only use Town Carpenter again but highly recommend them to all of our friends and family. Gary Luke and his team at The Town Carpenter offer the best customer service and ability to tailor pieces to the project’s needs that I have encountered. Not only that, but their level of craftsmanship and quality of materials exceed my expectations on every single job. The Town Carpenter has helped us to design and build a beautiful new kitchen, a home office, master bath, bedroom, bookcases, and an entertainment center over the course of eight years. We return for each project for the superior quality, professionalism, timeliness and guarantee of workmanship. We value the consistency of honest and reliable service we know we can expect from The Town Carpenter. 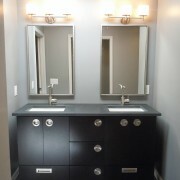 In our opinion, The Town Carpenter did a superb job designing, constructing, and installing our bathroom vanity. We found working with The Town Carpenter a positive experience and were pleased with the end result. We think that you are true craftsmen who do beautiful work, and are honest, dependable, and so easy to work with. We have gotten so many compliments on our cabinets; everyone who sees them raves about them. We LOVE the “extra” things that they suggested for us – the area above the refrigerator for casserole dishes, cookie sheets, etc…, the section that has drawers instead of cabinets, the lazy-susan corner cabinet, the built-in serving area with the cabinets above them with the glass panes. It’s all beautiful, and it’s updated our house so much; the kitchen’s my favorite place to be now. We think you’re the best, and are so grateful that Maggie found you for us. Hope all is going well with you. The Town Carpenter completed several projects for us. 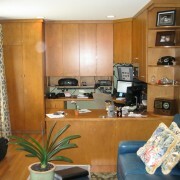 They added shelving and cabinets to an existing den. It looks as though it has always been that way. They also completed bookcases, a stereo cabinet, kitchen cabinets and shelving for our basement when it was being finished. It all looks great and we frequently get positive comments from visiting friends. 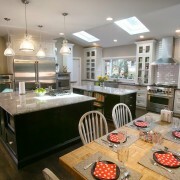 I particularly like the kitchen cabinets and island The Town Carpenter built. The Town Carpenter is very easy to work with, has creative ideas to help in planning a project and is very responsive to questions and concerns regarding the job. We have been extremely pleased. Recently, we were faced with making a critical decision for our new home that is was being built in SC. We went and visited all the traditional kitchen cabinet companies and met with their design consultants and viewed their lines of products. Every time we went to one of these companies, we came away feeling that they were not a good value and their methods of providing semi-custom cabinetry did not fit our needs. This is when we came across The Town Carpenter. Not only were they enjoyable to work with, their cabinetry had better construction and beauty, along with a lower investment. Their personal touch was something I would have never received with these other companies. Now, we have the most beautiful cabinets and we both love them so much. In fact, we were so impressed with The Town Carpenter; we are going to use them to build some of the furniture for our furniture store, The Rustic Cabin. We just completed finishing off our basement. We had many cabinet companies provide us with estimates for three entertainment built-ins and a wet bar. This was an easy decision for us. The Town Carpenter was head and shoulders above every other cabinetry company when it came to professionalism, listening to our needs, and providing us with the highest quality cabinetry we have ever seen. When the cabinets were installed, they exceeded my already-high expectations. This is the best cabinet company we have ever dealt with and we highly recommend their services. Feel free to call us with any of your questions on cabinetry selection.